Public complaints against those who abuse the rule of law are legitimate and do not breach any law, and neither should they be construed as sedition, says the Prime Minister. “Citizens can make reports on these matters or openly speak about them. “From the Rulers to the Prime Minister and Ministers, to civil servants and ordinary citizens – the rule of law applies to everyone,” he added. 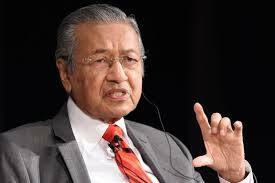 Writing on his blog Chedet on Tuesday (Jan 2), Dr Mahathir said the basic law of Malaysia is the Federal Constitution. “It is a comprehensive body of laws which determines the legal structure of Malaysia from the Yang di-Pertuan Agong to the Rulers of the states, to the federal and state governments and the bodies empowered to rule and enforce. “There is no provision which exempts anyone from the rule of law. “For the Rulers, there is a special court, but (these) laws are the same as the laws applicable to ordinary citizens. The Rulers too must respect the laws. “It is disturbing to see blatant breaches of the law being perpetrated in the mistaken belief that immunity has somehow been accorded,” he added. Dr Mahathir pointed out that Malaysia is a democracy – that is, “rule of the people by the people, and for the people”. “This, by common consent, takes the form of a parliamentary democracy with a constitutional monarch at the state and federal levels. “Towards this end, the Constitution and law at different levels have been promulgated. “Unfortunately certain breaches of the laws have been committed without action being taken by law enforcement agencies. “In other words, the rule of law has been ignored. “The result is predictable. Citizens suffer from injustices. Businesses cannot be done properly. Property has been seized. Unusual and illegal actions have been perpetrated,” he added. In the run-up to the general election last May, Pakatan Harapan had promised to restore the rule of law. The former prime minister Datuk Seri Najib Tun Razak, said Dr Mahathir, had ignored the law when it suited him. “In fact, laws were abused in order to oppress the people,” he said, promising that the Pakatan government that he leads will uphold the law and the rights of citizens.